and the lives of their families through education." From my first days in Manatuto, I thought about starting a scholarship fund; the need was obvious and the organization seemed straight forward. Thanks to the generous support of people who bought the calendar last year, we had funds to start one: Together with my host family, I started a young women's college scholarship fund, and named it after the deceased leader of the family, Sra. Lina. Because of the generosity of our supporters, we had over $500 to start this fund. Through a democratic process, the board of directors picked two young women to receive the scholarship for the first year. We helped them paid their application and exam fees, and then paid their entrance fees and regular tuition. One recipient, Sra. Rosa, had been in college five years ago but dropped out because of lack of funds: she is delighted to be continuing her studies. The other young woman, Acatha, had graduated from high school the year before and had not had the money to attend university. Now she is happily studying along side her old friends and aspires to study law. Because of the undeniable need and the overwhelmingly positive response to the scholarship fund, the fund has grown. Through sales of the 2007 calendar and generous donations, we raised sufficient funds to cover the costs our current recipients for four years! We are now raising funds to increase the number of students we can support and be sure we can support them until they get their degrees. Despite persistent political problems in the country for the last year and a half, the national university and Dili university operate a normal schedule now and all the students are studying hard. This last year, the Boavida Family, with help from the new fund treasurer, Nina Amaral, has taken over full management of the fund, with only minimal help from me. The family carried out the selection of new students, and manages all the dispersment of living allowances and payments to the two universities. We now support four women in university and will keep adding two per year until we are funding ten women. The political and social atmosphere in Dili is uncertain and challenging for the students. They depend on moral support from their families and friends. Now, the students have started to meet regularly forming a self-help group. Rosa, from the first group, is enthused again, now that her school has somewhat recovered from political troubles and major vandalism and theft. She reports that UNDIL students are once again organizing soccer and volleyball matches. Tomasia, from the second group, is flourishing at UNTL, reporting that she is excited by all the people she has come to know and how much she is learning from her fellow students. We have a new student, Manuela, who was at the top of her class in Manatuto and is excited to be studying Biology at UNTL, where she gained acceptance despite record numbers of applicants for few spots. Another student we supported through application, Josephina, will try again next year as she didn't pass the rigorous entrance process. She is attending supplementary courses and learning English. The scholarship students meet ocassionally to give each other support and exchange ideas. Pictured above are: Nina, the fund's volunteer treasurer, Josephina who is studying for next year, Tomasia who is thriving in her second year at the national university, and Manuela who has just started her first year as a biology student at the national university. My host mother was a community leader, resistance fighter, clandestine organizer, women's group founder, cooperative president, literacy teacher, and mother of ten. Sra. Lina gave of herself for many years, improving life for women in East Timor: she confronted occupying forces, first with a gun and then by organizing women in the clandestine movement; she demanded the new government deliver on promised aid; she negotiated with aid agencies to start viable businesses to employ local women, and she led her family in respectable and progressive ways, asserting women's equality. After her death in 2003, the Boavida family discussed ways of remembering her contribution and carrying forward her mission of helping women in Manatuto. Out of this discussion grew the scholarship fund and thus we have named the fund in Sra. Lina's memory. The scholarhip will fund students to go through the process of applying to university and the basic costs of attendance for up to five years, or until the student earns her bachelor's degree. We will cover tuition, fees, and provide ten dollars per month for spending money. Students will live with extended family for their time in Dili. Our goal is to raise sufficient funds to add two students every year for five years. If all the students stayed enrolled, which would be impressive for East Timor, we would have up to ten students by the end of this time. This would be a steady, sustainable number. 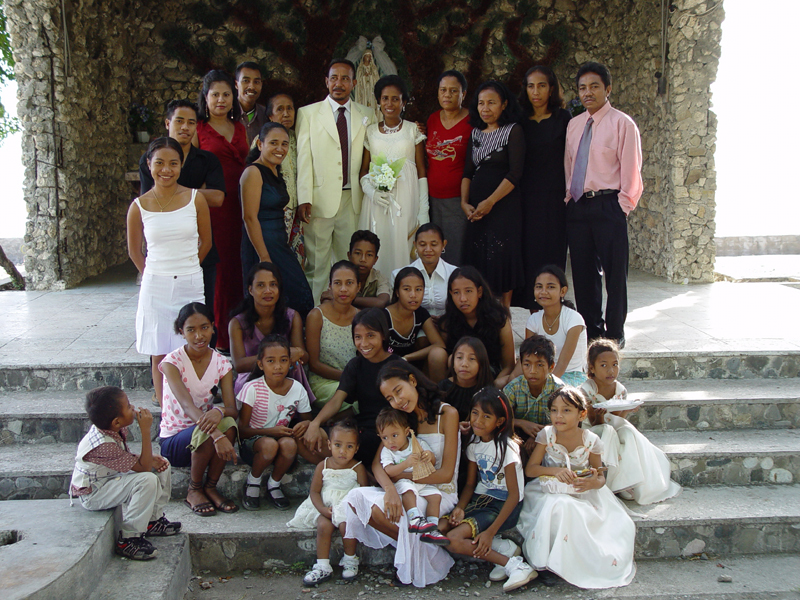 In July of 2005, the family announced to the Manatuto Community that we had formed a scholarship fund and would accept applications from women wishing to attend university in Dili. The family organizes the recruitment and selection of students every year, and monitors their progress. The fund now supports three classes, with four students total. We are covering tuition and fees, and help with incidental costs, too. So long as their grades remain above average, we'll keep supporting them through their fifth year. I am hopefull that this is the beginning of a good thing. My favorite part of the scholarship plan is that the recipients will act as mentors to those following, becoming big sisters of sorts. This could help the incoming students overcome a lot of the social and logistical obstacles to enjoying their first months in school and help put them on track to succeed. Now the recipients meet every couple of months to share ideas and experiences. We've actually written by-laws (in Tetun) and elected a board of directors, complete with secretary and treasurer. Boavida family members control the board and run the scholarship, but no direct family members can receive the scholarship. They all agreed this would open the organization up to too much criticism from the community. Instead, I've offered to help match friends and family of mine with the girls within the family, to help them save up for their education. If anyone would like to make a direct contribution to support one or more of Sra. Lina's four girls or numerous nieces, contact me directly. You can see below a picture of some of the immediate Boavida family members. Several of Avo (grandmother) Rita's nine children have had nine or ten children of their own. These grandkids have started families already, and so the family is getting quite large. The benefits to increased education for women are many, not least among these is more sensible family planning. The young women in the family who have already attended college have already expressed a strong inclination to keep their families to two or three kids only! © 2007: All content within this site is copyrighted material, the property of Michael Jones, unless otherwise stated. Only non-commercial use of this material is allowed without prior permission of the creator, Michael Jones.